It appears that Google has started pushing out a brand new feature to those using YouTube TV on their Android devices. The new feature called “voice remote” appeared for the first time several months ago, but only as a support page that didn't offer any details on what's to come. 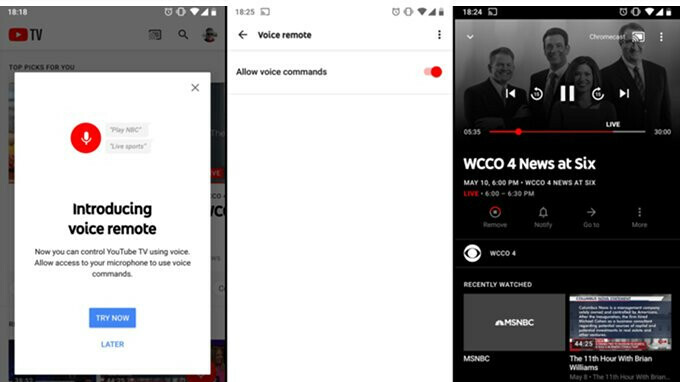 Suddenly, many YouTube TV users noticed their Android clients have been gifted with the option to control the app by voice. Apparently, you'll be able to access “voice remote” from the floating action button that now appears in the Android app. It's worth mentioning that this isn't an update that you can download from the Google Play Store, but rather a server-side push that enables “voice remote” on selected Android devices in waves. Since this is a server-side update, you'll be notified when “voice remote” becomes available on your Android device, so don't try to look for the new feature in the Google Play Store just yet.